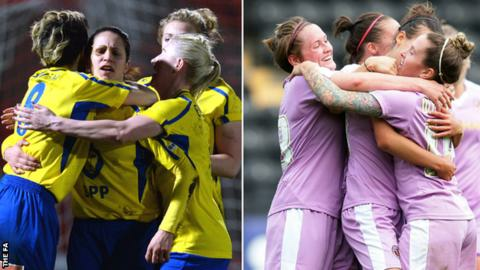 Doncaster Rovers Belles and Reading were both promoted to Women's Super League One after victories on Sunday. Reading remain second, three points behind the Belles, but with a game in hand on the leaders. At The Hive, the Belles fell behind to Emma Whitter's early goal before Sweetman-Kirk, the league's top goalscorer, netted either side of half-time to reach 20 league goals for the season. That win was enough to secure promotion for Doncaster regardless of other results, ensuring a return to the top flight for the first time since their controversial demotion in 2013. Kayleigh Hines' early goal for Oxford saw them win at Yeovil, with the midfielder later involved in a collision which saw Nat Haigh taken off with a serious-looking head injury. Melissa Fletcher, Helen Ward and Rachel Rowe all scored for the Royals at bottom club Watford, who did pull one back with an Ellie Mason penalty. Elsewhere, Aston Villa won 2-1 away at Millwall Lionesses. Read more on Man Utd: Are the Premier League leaders genuine title contenders?